Tommee Tippee renovates 'scariest' workplace lactation room in the U.S. The U.K.-based brand wanted to increase awareness of its Pump and Go product in the U.S., a country where women quickly return to work after giving birth. Images of dreary, depressing workplace lactation facilities being shared on social media inspired baby bottle brand Tommee Tippee to launch a pump room renovation contest. 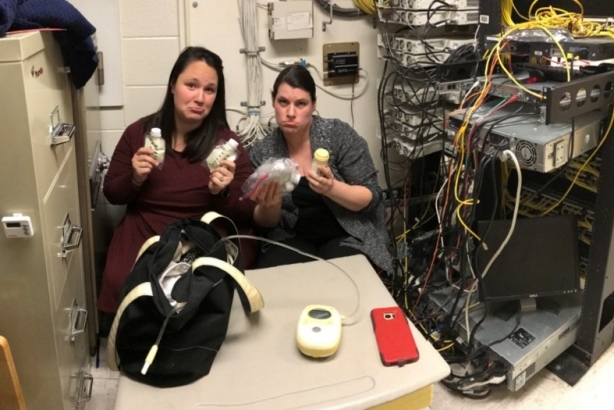 Working moms across the country were encouraged to submit pictures of their horrendous workplace pump rooms for a chance to have them transformed. Planning for the campaign began about six months prior to launch. 360PR+ worked with Tommee Tippee to develop the campaign content, digital and creative assets, and spearhead media and social outreach efforts. The goals of the campaign were to drive awareness of the brand among expectant and new parents, and increase sales for the brand's breastmilk management system, Pump and Go. The campaign was focused on the U.S. market. "Tommee Tippee is a U.K.-based brand that came to the U.S. about seven years ago and, while they are rapidly growing here, there is a lot of brand awareness work to be done," explained Kalley Jolly, 360PR+ SVP. "Pump and Go has been a priority product in the U.S., mostly because we see far more women returning to work more quickly than in the U.K."
A key aim was to establish multiple opportunities to connect with both consumers and media. "With programs we've done in the past, we noticed you put all this energy into the strategy, the planning, and the build, and it's sort of one and done," said Sharon Swan, brand director at Tommee Tippee. "We wanted to be able to keep stoking this conversation, so a phased approach was really an intentional plan." Tommee Tippee also wanted to collaborate with a strategic partner that could help engage moms in a funny way and amplify campaign reach. In terms of media outreach, the campaign team targeted parenting and business outlets, given the workplace angle. The brand developed a partnership with Scary Mommy, one of the top parenting publishers in the U.S., to help drive awareness and consumer engagement. Mediaworks managed the paid partnership. On January 30, the campaign officially launched with a press release and the microsite going live. That same day, Scary Mommy posted a launch video on social which announced the Scary Pump Rooms contest. Centra worked to develop the rules and regulations of the contest, and coordinate prize fulfillment. Fans could post submissions to the contest on the microsite through February 13. On March 9, the brand announced four finalists on social and opened the vote for the scariest room to the public. The campaign team executed on outreach to parenting and female-focused lifestyle outlets and hosted a joint Twitter party with Babies "R" Us. Thank you for joining our #ScaryPumpRooms #TwitterParty today! We enjoyed hearing from you. A huge thanks to @BabiesRUs for participating! "The vast majority of the promotion was via social media and media outreach," added Jolly. "We did quite a bit of promotion through Scary Mommy and our own social channels to drive people to the microsite." On June 28, the brand announced two school teachers in Newark, Delaware, as the contest winners. The transformed space was unveiled via Facebook Live. Project Nursery, a design company and child-focused community platform, helped with the renovation. During this phase, outreach was focused primarily on local media in the Philadelphia and Delaware area. Additionally, Tommee Tippee encouraged employers to help improve pump rooms by providing 100 companies across the U.S. with prize packs, which included brand products and pump room décor. During the campaign, the brand saw a 20% increase in Pump and Go sales across the U.S.
On social channels, the campaign received 108,000 social engagements, measured through likes, shares, click-throughs, and comments. The brand tallied nearly 8,000 votes for the top four finalists. The Scary Mommy campaign launch video generated more than 2.7 million video views. The winning room reveal video hosted on Facebook Live had more than 20,000 views. Media outreach efforts helped drive coverage in parenting outlets, as well as business and lifestyle publications, including: Forbes, People, Self, Fit Pregnancy and Baby, The Bump, and HGTV.